Mast Cells and Basophils will be essential reading for immunologists, biochemists and medical researchers. 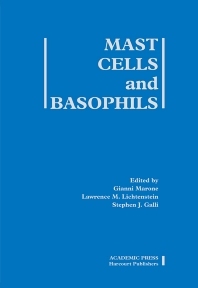 Detailed chapters cover all aspects of mast cell and basophil research, from cell development, proteases, histamine, cysteinyl leukotrienes, physiology and pathology to the role of these cells in health and disease. Chapters also discuss the clinical implications of histamine receptor antagonists. Medical and academic researchers working in immunology, cell biology,pharmacology, biochemistry, endocrinology, and medicine with particular attention towards allergic response. Do Mast Cells Produce Interferon-γ? Do Mast Cells Produce Nitric Oxide? How does Nitric Oxide Regulate Mast Cells? The Mast Cell in Myocardial Ischaemia/Reperfusion: Friend or Foe? Stanford University Medical Center, Palo Alto, California, U.S.A.